WHAT IS BID'AH AND WHY IS IT THE MOST DANGEROUS THING EVER? Imaam al-Shatibee in his excellent work, al-I'tisaam, has provided the most comprehensive, concise and definitive legislative definition of al-bid'ah (البدعة) and the foundations would not be complete except by a discussion of it. - And by whose practice exaggeration in worshipping Allaah, the Exalted, is intended. Linguistically Bid'ah (innovation) means 'a newly invented matter'. Imam Ash Shatibi also says "A newly invented way [beliefs or action] in the religion, in imitation of the Sharee'ah (prescribed Law), by which nearness to Allaah is sought, [but] not being supported by any authentic proof - neither in its foundations, nor in the manner in which it is performed." There are many forms, types and explanation of Bid`ah. But for starters the above shall suffice. [Related by at-Tabraanee in al-Awsat (4360), and authenticated by Shaikh Albaanee in As-Saheeha (1620); Also : Authenticated by Al-Mundhiree, (At-Targheeb, 1/45), Ad-Diyaa’ (2054, 2055), Al-Haitamee (Az-Zawaajir, Kabeerah 51: Tark-us-Sunnah), Al-Ghumaaree (Al-Mudaawee, 2/262-263), Al-Albaanee (As-Saheehah, 4/154; Zilaal-ul-Jannah, 37; Saheeh-ut-Targheeb, 54; Saheeh-ul-Jaami`, 1699; Al-Manaasik, p.44; Hajjat-un-Nabee, p. 101), Al-Hilaalee (Al-Bid`ah, p.130; Al-I`tisaam, 1/162, 2/782), Al-Halabee (`Ilm Usool-il-Bida`, p.33), Mashhoor Salmaan (Al-I`tisaam, 1/212, 112; Al-Mujaalasah, 6/398-399) and others. Al-Haithamee said: “Its narrators are those of the Saheeh except for Haaroon ibn Moosaa Al-Farawee who is reliable.” (Al-Majma`, 10/189). `Abdul-Muhsin Al-`Abbaad (Al-Kutub war-Rasaa’il, 7/318-319) and others also alluded to its authenticity. See also: Mu`jam-ul-Mudalliseen (p.168-172). The prophet (s.a.w) said: "Every servant of Allah possesses some propensity/enthusiasm (shirra), and every propensity has its course (fatra) - either to the Sunnah, or to innovation. If one's propensity is for the Sunnah he has succeeded. If otherwise, he has perished". “Whosoever honors an innovator he helped in pulling down Islam. The Messenger of Allaah (sallallaahu alaihi wasallam) said: "Every innovation is misguidance and going astray"
And he (sallallaahu alaihi wasallam) also said: "… and every innovation is misguidance and all misguidance is in the Hellfire." The prophet (s.a.w) also said : "No people introduce a bid’ah but something equivalent (amount) will be taken away from the Sunnah"
Al-'Irbaad ibn Saariyah, , reports that the Prophet said, ".... I have left you upon clear guidance. Its night is like its day. No one deviates from it after me except that he is destroyed." ASK YOURSELF DO WE REALLLY NEED TO INNOVATE OR INVENT? LIKE REALLY? We jump and dance when our Boss or normal folks compliment us but here the Lord of the universe is complimenting Muhammad (s.a.w) so how on earth in your SENSES would you leave his guidance and follow someone else's example or guidance? Be it an Imam, a mc-donalds cashier, a Mullah, a Baba, a Peer, an etc? 3) the Salaf used to say : " Whoever innovated something in Islam it is as if he claimed Muhammad did not complete his duty of conveying everything about Islam to us"
woahhh ! so now you understand the insult you are implying towards the prophet (s.a.w) by following and indulging in an innovation?? It was narrated from Abu Dharr (may Allah be pleased with him) that the Messenger of Allah (blessings and peace of Allah be upon him) said: “There is nothing by means of which one may draw close to Paradise and move far away from Hell but it has been explained to you. 1) Abdullah Ibn Abbas (r.a) (d. 68H) said: "Indeed the most detestable of things to Allaah are the innovations." 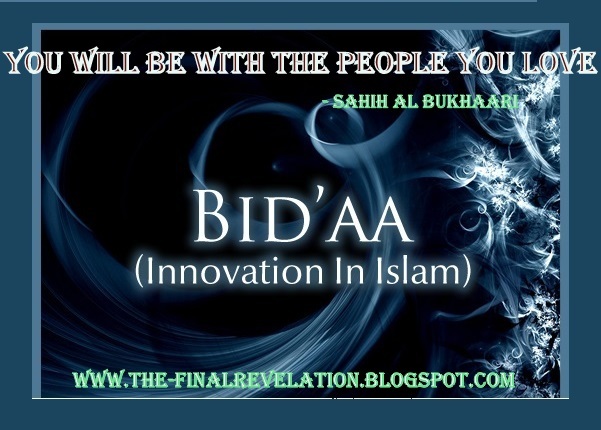 Abdullah Ibn Abbaas (r.a) also said, "When "Bid'ah (innovation)" is created then the Sunnah dies and this continues until that "Bid'ah" is living and the Sunnah is dead." Ibn Abbas r.a states : " Every year the people of innovations innovate some or the other bid`ah and wipe away some or the other sunnah due to which innovations come alive and sunnah becomes dead ." (حديث موقوف) أَخْبَرَنَا أَخْبَرَنَا عِيسَى بْنُ يُونُسَ ، نا ابْنُ جُرَيْجٍ ، عَنْ عَطَاءٍ ، قَالَ : سَمِعْتُ ابْنَ عَبَّاسٍ ، يَقُولُ : " عَجَبًا لِتَرْكِ النَّاسِ هَذَا الإِهْلالَ ، وَلِتَكْبِيرِهِمْ مَا بِي إِلا أَنْ يَكُونَ التَّكْبِيرُ حَسَنًا ، وَلَكِنَّ الشَّيْطَانَ يَأْتِي الإِنْسَانَ مِنْ قِبَلِ الإِثْمِ ، فَإِذَا عُصِمَ مِنْهُ جَاءَهُ مِنْ نَحْوِ الْبِرِّ لِيَدَعَ سُنَّةً وَلِيَبْتَدِعَ بِدْعَةً " . "Every innovation is misguidance, even if the people see it as something good." Shaykh Al-Albānī explained that ‘he never went beyond it’ means: he never added anything to what was in the hadīth or over­ stepped the bounds of the hadīth; and ‘he never fell short of it’ means: he never ne­ glected what was in the hadīth. 3) Abdullaah ibn Mas'ood (r.a) said, "Follow and do not innovate, for you have been given that which is sufficient and every innovation is misguidance." "For every bid’ah with which Islam is plotted against, Allah has a beloved worshipper (wali) who refutes and repels it and speaks about its signs, so take the full opportunity of attending such places, and trust in Allah. He (r.a) also said: "You must hold fast to knowledge [Sunnah] before it is taken away. This taking away consists in the departure of those who possess it. None of you knows when he shall surely need one of them, or needs what he has. Verily you shall encounter a people who claim that they are calling you unto Allah's Book when in fact they have tossed it behind their backs. So hold fast to knowledge, beware of innovating (al-tabaddu`), beware of excessive contention (al-tanattu`), and beware of deep involvement (al-ta`ammuq). Hold fast to the ancient (al-`atiq). Ibn Mas'ood (r.a) said " A person is like his friend"
Abi Dawood narrated that Mu’adh ibn Jabal, may Allaah be pleased with him, said to his companions one day: “Indeed after you there will be tribulations in which wealth will be abundant. The Qur‟aan will be opened therein, so much so that the believer, the hypocrite, the man, the woman, the child, the elder, the slave, and the freeman will memorize it.” A person would say: „What is with the people, that they do not follow me while I recite the Qur‟aan? They will not follow me unless I innovate for them other than it.‟ So beware of what is innovated. For that which is innovated is misguidance. 4) Ahmad Ibn Hanbal (r.h) once said, "The greatest sinner (faasiq) from the Ahl-Sunnah Wal Jamaah (one following rasool and his companions) is better than the most pious person from Ahl-"Bid'ah". 5) 'Umar ibn 'Abd Allah-'Azeez (r.h) said, "There is no excuse for anyone, after the Sunnah, to be misguided upon error which he thought was guidance." Imaam Sufyan at-Thawri rahimahullah also said : No statement is accepted/complete/truthful without enacting upon it, and no speech or action is accepted without (it’s proper) intention and no statement, action or intention is accepted until it is in accordance to the sunnah. حدثنا سليمان بن أحمد ، ثنا محمد بن النضر الأزدي ، ثنا عبد الصمد بن يزيد ، قال : سمعت الفضيل يقول : " من أحب صاحب بدعة أحبط الله عمله ، وأخرج نور الإسلام من قلبه " . Another similar matter has also been indicated by Imaam Maalik (rahimahullaah) in a reported saying of his that ought to be recorded in golden ink. And it is his saying: "Whosoever introduces into Islaam an innovation, which he deems is good, then he has claimed that Muhammad has betrayed (the trust of conveying) the Message. Read the saying of Allaah, the Mighty and Majestic: 'This day I have completed your Religion for you, and I have perfected My favour upon you, and I am pleased with Islaam as a Religion for you.' [Surat-ul-Maa'idah: 3] So whatever was not (part of) the Religion on that day, is not (part of) the Religion on this day. And the last part of this ummah (nation) will not be rectified, except by that which its first part was rectified by." 13) Imaam al-Barbahaaree (rahima-hullaah) mentions: "The innovators are like scorpions. They bury their heads and bodies in the sand and leave their tails out. When they get the chance they sting; the same with the innovators who conceal themselves amongst the people, when they are able, they do what they desire "
Imam Al-Barbahaaree is one of the companions of Ahmad Ibn Hanbal, said, "Beware of "Bid'ah", because every "Bid'ah" started out as something small and resembling the truth and people were fooled by it and followed it until it became bigger and bigger and were trapped by it and it took them out of Islaam." Shaykh al-Barbaharee (D. 329H Rahimahullah) Also states: May Allah have mercy upon you. Know that the Religion is what came from Allaah, the Blessed and the Most High. It is not something left to the intellect and opinions of men. Knowledge of it is what comes from Allaah and His Messenger, so do not follow anything based upon your desires and so deviate away from the Religion and leave Islam. There will be no excuse for you since Allaah's Messenger explained the Sunnah to his Ummah and made it clear to his Companions and they are the Jamaa'ah and they are the Main Body, and the Main Body is the truth and its followers. 14) Abu Haatim (rahima-hullaah) said: "A sign of the people of innovation is their battling against the people of Narrations". 15) as-Saffaareenee (rahima-hullaah) said: And we are not focusing on mentioning the virtues of the people of Hadeeth, for indeed their virtues are well known and their merits are many. So whoever belittles them, then he is despicable and lowly. And whoever hates them, then he is from the backward party of the Devil. "Whoever listens to a person of innovation – and knows that he is a person of innovation – then protection is taken away from him, and he is left to himself"
20) Hasan Ibn Attiya (r.h) one of the Ta'baeen said, "When the people accept the "Bid'ah" , Allah removes the Sunnah from among them and doesn't return it until the day of judgment." sufficient for them was sufficient for you." قال :( لا يستقيم الإيمان إلا بالقول ، ولا يستقيم الإيمان والقول إلا بالعمل ، ولا يستقيم الإيمان والقول والعمل إلا بنية موافقة للسنة . فمن آمن بلسانه وعرف بقلبه وصدق بعمله فتلك العروة الوثقى التي لا انفصام لها . 32) An innovator once asked Ayyoub As-Sakhtiyaanee (r.h): Oh Abu Bakr , may i ask you about a word? he (al Ayyoub) turned away and indicated with his hand "no, not even half a word"
33) Abu Dawood as-Sijjistaani (d.275H) said : I said to Abu 'Abdullah Ahmad ibn Hanbal : "If i see a man from Ahlus-Sunnah, sitting with a man from the people of bid'ah (innovation) , should i abandon speaking to him? He (Ahmad ibn Hanbal) said : " No, you should first inform him that the one whom you saw him with is a person of innovation. (then) either he will cease speaking to the innovator - so continue speaking to him - or if not, then regard him to be like him "
"Ahead of you are times of trials (fitan) in which there will be much wealth and in which the Qur'an will be opened and taken (read) by believers and hypocrites, men and women, young and old and freemen and slaves. At that time it is likely that there will be people who will say, “Why aren’t the people following me when I have read the Qur'an? They will not follow me until I invent something else.” So, beware of everything that is innovated (in religion), for those things that are innovated are misguidance." 1. Shirk (major and minor). He was asked: "what is 'opinion' "? He said: "Ignoring the Book of Allaah and the Sunnah of His Messenger صلى الله عليه وسلم and acting upon ones own opinion." said to a man who had spoken a bid'ah (quran is created) and invited people to it. "Did the Messenger of Allah (s.w.t), Aboo Bakr, 'Umar, 'Uthmaan and 'Alee know it?Or did they not? The man replied,"They did not know it." He said "So you know something they didn't know?" The man then said,"I said that they did know it." Al-Athramee said,"Was it appropriate for them not to speak about it or call people to it, or not? He replied. "It was appropriate for them." Muhammad then exclaimed,"Something which was appropriate for the Messenger of Allah(s.w.t) and his companions is not appropriate for you!" The man then became silent.The Caliph, who was present at that thime said," Allah will not elaborate (the meanings) for the one who does not find appropriate what they found appropriate." (Aḥmad bin ‘Ali bin Ḥajr al ‘Asqalani, Tahzīb at Tahzīb, Vol. 1pp.398-399, Mu’as-sasatu al Risālah). To act according to Sunnah moderately (without much efforts) is better than worshiping in an innovated way even if it is done by putting much efforts. The following narrations are quoted from the book of Al-Imam al-Hafiz Abul-Qaasim Habatullaah ibn al-Hasan ibn Mansoor at-Tabaree AL - LAALIKAA'EE (d.418 H) , titled " Sharh Usool I'tiqaad Ahlis-Sunnah wal-Jamaa'ah ' referenced to "1/135-136/no. 252"
(31)...from Ayyoob (as-Sakhtiyaanee) who said: "Indeed from the well-being of a youth or a non-Arab is that Allah should guide them to a scholar from the companions of the Sunnah." (32) ... from Ibn Shawdhab who said : "indeed from the blessings of Allah upon a youth who seeks to worship Allah is that he is granted as a brother a companion of the Sunnah who encourages him upon it." (246)...From Ayyoob as-Sakhtiyaanee who said: Aboo Qulaabah said to me "O Ayyoob, memorise four things from me: Do not speak about the Quraan from your opinion, and beware of Qadr, and if the companions of Muhammad are mentioned then withhold (as in respect), and do not let the people of innovation gain access to your hearing." (248)...Ma'mar said: Ibn - Taawoos was sitting when one of the Mu'tazilah came and began speaking, so ibn Taawoos entered his fingers into his ears and said to his son: "O My son put your fingers into your ears and press tightly so you do not hear any of his speech." Ma'mar said: Meaning that the heart is weak. (249)...'Abdur Razzaaq narrated to us saying: Ibraaheem ibn Abee Yahya said to me: "I think that there are many from the Mu'tazilah in your area!?" I said: "Yes and they claim that you are one of them." He said: "Will you enter this shop with me so that I can speak with you?" I said: "No." He said: "Why?!" I said: "Since the heart is weak and the Deen is not for the one who overcomes in debating." (251)...From Al-Awzaa'ee who said: 'Umar ibn 'Abdul - 'Azeez said: "if you see a people meeting secretly concerning the Deen with anything to the exclusion of the common people - then know that they are upon the foundation of misguidance." (252)...Yoosaf ibn Asbaat said: I heard Muhammad Ibn An - Nadral - Haarithee say: "Whoever lends ear to an innovator - and knows that he is an innovator then the protection is removed form him and he is left to himself." (253)...Yoonus ibn ' Ubayd said: "Do not sit with a ruler or an innovator ." (254)...Amad ibn Yoonus said: A man said to Sufyaan - and I was listening - 'O Aboo' Abdullaah advice me.' He said: "Beware of innovated sects and disputation and beware of rulers." (259)...Yahyaa ibn Abee Katheer said: "If you see a person of innovation upon a certain road then take a different one." (260)...Ismaa'eel at - Toosee said: Ibn al - Mubaarak said to me: "let your sitting be with the poor and beware of sitting with a person of innovation." (268)... al-Fudayl said: "Glad tidings for one who died upon Islam and the Sunnah - and if that is the case then let one say much : As Allah wills (Maa Shaa Allah)." (270)... al Hasan said: "From the person of innovation Allah does not accept Prayer, nor Fasting, nor Hajj, nor 'Umra, nor Jihaad, nor repentance, nor charity." (271)... al Hasan said: "Allah does not accept anything from a person of innovation." (272)... al-Fudayl ibn 'Iyaad said: "No action of the person of innovation is raised up to Allah." (273)... Ibraaheem ibn Maysarah said: "He who honours an innovator has assisted in the demolition of Islaam." (274)... 'Abdullaah ibn 'Umar as-Sarkhusee - the scholar of al-Khazar - said: I ate a single meal with an innovator and Ibn al-Mubaarak heard of it so he said : "I will not speak to him for thirty days." (275)... al-Fudayl said: Ibn al-Mubaarak said: "I have not seen any wealth which I despise more than that of a person of innovation and he said: 'O Allah do not let any innovator give me anything so that my heart should love him." (276)... from Ibraaheem [i.e. an-Nakha'ee] who said: "There is no backbiting regarding an innovator." (278)... from al-Hasan al-Basaree, who said: "There are three who have no inviolability with regard to backbiting: one of them is the person of innovation who calls to his innovation." (281)... from Katheer, Aboo Sahl who said: "It is said that there is no inviolability for the people of innovated sects." (284)... from 'Abdullaah ibn al-Mubaarak said: "The person of innovation has darkness in his face even if he anoints it thirty times a day." (286)... Sallaam ibn Abee Mutee' said: a man said to Ayyoob: 'O Abu Bakr, 'Amr ibn 'Ubayd has turned back from his opinion !!' He said: "He has not turned back." He said: 'Indeed, O Aboo Bakr, he has turned back." Ayyoob said: "He has not turned back - (three times) - he has not turned back. Have you not heard his (sallallaahu `alaihi wasallam) saying:"They shoot out from the Deen just as the arrow shoots through the prey, then they do not return to it until the arrow returns to the bow - string"." (290)... Ayyoob used to call all the people of the innovated sects 'Khawaarij' and say : "The Khawaarij have different names but are all united upon use of the sword." (293)... Malik ibn Anas said: " Is to be the case that every time someone comes who can argue better than another that we are to abandon what Jibreel brought to Muhammad (sallallaahu `alaihi wasallam) because of his argument?!" " Turning away from the innovators (heretics) and having hatred for them"
* Reminds me of the saying of Ibn 'Abbas (r.a) wherein he (r.a) said : When "Bid'ah (innovation)" is created then the Sunnah dies and this continues until that "Bid'ah" is living and the Sunnah is dead." The Shaikh of Aboo Daawood and an-Nisaaee once debated an innovator who said the Qur’aan is created (i.e. the speech of Allaah is created) this is what took place. The Shaikh: Did the Prophet and his successors know of this bid’a? The innovator: No they did not know of this. The Shaikh: So if they did not know of this, how is it possible that you came to know of it? The innovator: (retracts his statement) No, they knew about it. The Shaikh: If they indeed did know of it, do you truly think they would not have mentioned it (in a hadeeth etc) or call mankind towards this (knowledge) or was that not a possibilty? The innovator: No they kept quite about it and did not mention it. The Shaikh: So you are saying that something the Messenger of Allaah and his companions kept silent about and did not mention, you mention instead?! And thus the innovator was dumb struck and the Khaleefah at that time was so impressed that he supported the Sunnah and ordered those who spoke about matters our Prophet did not speak about (i.e. spreading lies about him) to be taken far away from his presence. "Deterrent against loving the people of innovation, since the person will be with those whom they love "
Chapter : "Disassociating from the people of innovation and the people of sin"
Chapter: "Forbiddence of sitting with the innovators"
Chapter : " What is related from the prophet sallalahu 'alaihi wa salaam with regards to the forbiddance of debating with the innovators "
It is as they said, for if a person does not follow what the Messenger came with he will act according to his own wishes. Thus he will be one who follows his desires without guidance from Allah. Ibn Taymiyyah has a nice passage in one of his books showing that: "In fact, the kufr of Jews and Christians is because of "Bid'ah". They introduced new things into the religion and those things took them completely away from the true message of Musa (Moses) and Isaa (Jesus) Alaihumma Salam". So just as the condition of the Arabs during the Days of Ignorance (Jaahiliyyah) was not rectified except by the coming of their Prophet Muhammad with revelation from the heavens - which aided them in this world and which will save them in the next - then the foundation that the good Islaamic well-being must be set upon in this time, is nothing else but the return to the Qur'ân and the Sunnah. In spite of this, this matter needs a little bit more of articulation, due to the vast number of Islaamic groups and parties that are present on the arena and which claim for themselves to be upon the way by which Islaamic society and Muslim rule can be actualized. IMAAM IBNUL QAYYIM AL-JAWZIYYAH - war against the innovators is greater than the war against the Mushrikeen. Question: Is the absence of refuting Ahlul-Bid'ah (the people of innovation) - and concealing their falsehood and defending them - considered as deception against the Muslims? It is not permissible for the Muslim who possesses knowledge to remain silent concerning innovation and deviance without clarifying it for the people. This is because if he remains silent, the people will use him as an argument, saying, 'if this was impermissible or prohibited, then the scholar so and so would not have remained silent about it while he sees it.' Na'am (yes)." When you mention a Fasiq (evildoer), explain his faults, so that people may be wary of him." For more such quotes from the prophet (s.a.w) himself, then please see: http://foodiefahoodie.blogspot.in/2010/03/exceptions-in-backbiting.html? Compiled by TFR. All good is from Allah and all the mistakes are mine. May Allah have mercy on the one who corrects me.